The incredible thing about these pancakes is that only 2 tablespoons of coconut flour is used, and so far, that’s the least amount of coconut flour that I’ve used for any recipe. These pancakes are really light and fluffy; it’s so beautiful to see them rising – when they rise, it’s rather subtle but watching them, you can see them just slowly, gently puffing up. 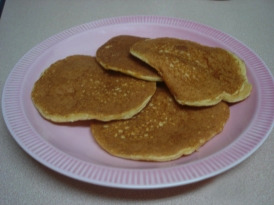 To see pancakes rise is something to feel very appreciative of, especially as usually SCD pancakes (I’m not entirely sure about GF/CF ones) do not rise – or are nearly as light or fluffy as their traditional counterparts – because the ingredients do not have the gluten or rising agents to do so, as traditional pancakes do. Eggs do help things rise a bit, but not very much. With almond flour it’s not very easy to make light and fluffy pancakes either, but making them with coconut flour is another story. Very light and fluffy, and the rising component came from using baking soda – the only adjustment I made to the recipe. On the first time round, the baking soda left an unpleasant, bitter aftertaste to otherwise enjoyable pancakes. I noticed that mixing the batter by hand and mixing it by an electric hand blender create different results. The batter mixed by hand is thicker (and a little more lumpy, from the coconut flour), as are the pancakes, than the one mixed by the electric hand blender (blending the batter with the blender somehow thinned it: it was still thick, but a little runny). Pancakes made from the batter mixed with the electric hand blender tend to be a little thinner. Also, note: as the pan gets hotter the pancakes appearance will gradually shift to the browned appearance as seen on the top of this entry. The original recipe makes a small amount (I got six pancakes out of it, whereas the original recipe states it makes four pancakes; I think it depends on how big a spoonful of batter is used) so if you’re intending to make a lot of pancakes double or triple it as necessary – though if making it for the first time I’d recommend making the original amount first, and then if it’s liked, make more. Note: as I said, I adjusted the baking soda amount, however the amount could be kept the same and instead the honey increased by at least another 1 or 2 teaspoons (it’s not that much). Either way, what we want is to have a fully-rounded flavour without a bitter baking soda aftertaste. Photo credits goes to yours truly, photographer, and a friend of mine for helping edit out the photo’s original time stamp (photo taken in September 2009; this photo was not edited or modified in any other way). Recipe from Sandra Ramacher (author of the SCD cookbook Cooking for Celiacs, Colitis, Crohn’s, and IBS). See the original recipe here. Heat coconut oil in a pan over medium heat. In a bowl, beat eggs with the teaspoon of coconut oil, vanilla, and honey, until light and frothy. Add coconut flour and baking soda, incorporating well and stirring out lumps. Once the pan is hot enough that water (or a drop of batter) sizzles upon contact, pour in a large spoonful of batter. Depending on the size of your pan, more than one pancake can be made at a time. Cook for about 2 minutes, or until bottom is browned, and flip. Once the other side is browned, remove from the pan and transfer to a plate to serve. Serve warm or cold, as is or with toppings of your choice (they’re great drizzled with honey). Enjoy! Let me how this recipe worked out for you, if you modified it or did anything differently, or if you have any questions, by leaving a comment. Feedback is always appreciated and is welcome. Thank you. My 3 year old son just started the SCD diet, and he LOVES these! He has been on the diet 4 days and I have already made 3 batches of these.He eats them for breakfast and wants them as a side for lunch and dinner as well. Thanks for a great recipe. I’m so happy to hear that, Monica! That’s wonderful. If your son doesn’t have a nut sensitivity or allergy, you may also like to try the almond flour crepes. They’ve very versatile, including being used for sandwich wraps. They’re not egg-y either and recently I found that, if there isn’t a neutral-tasting oil on hand or butter (if you’re not dairy-free) on hand, olive oil works just as well, without imparting any olive flavour at all and affecting the crepes’ flavour. In addition to your ingredients, I also use almond flour, coconut shreds, farmers cheese and bananas… The taste is INSANE!!! Love this recipe. People who don’t even need the SCD diet love these pancakes. Hi Greg, that’s fantastic! What are the proportions you use of your added ingredients?